POLICE have launched an investigation into an arson attack that completely gutted a house and a nearby caravan in the Kildress area. A total of three fire engines, from Cookstown and Pomeroy, spent just over two hours dealing with the blaze in the Kildress Terrace area, which was reported to the emergency services shortly after 10pm on Thursday. 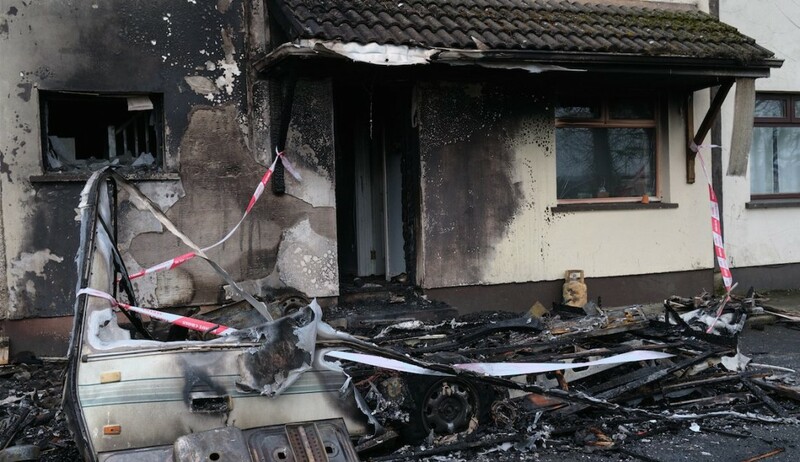 PSNI Detective Sergeant Robinson said that police received a report that a caravan located in the area was on fire and that the blaze had spread to a house close by. “Both the caravan and house were gutted as a result of the blaze. A second house in the vicinity also suffered smoke damage,” he said. After the Northern Ireland Fire and Rescue Service (NIFRS) ruled the incident as a ‘deliberate ignition’, the detective said the police were treating it as arson endangering life. Det Sgt Robinson appealed for any witnesses to come forward. “I want to appeal to anyone who was in the area, between 10pm and 10.05pm and saw what happened, or who has information which may assist our investigation to call detectives in Mid Ulster on the non emergency number 101, quoting reference 1400 of 21/03/19. “Alternatively, information can also be provided to the independent charity Crimestoppers on 0800 555 111. “This is 100 per-cent anonymous and gives people the power to speak up and stop crime,” the detective added.